Which small business apps are best? Here are few popular productivity apps that are useful for any small business owner, regardless of their business type or size. Productivity tools provide a solution to a specific problem. Some aim at efficiency while others seek to bolster collaboration or unite disparate data. There are thousands of productivity apps out there that can help you do everything from to-do list to delegate tasks to employees. Here are some best productivity apps for your small business. These Best Android apps of 2017: Productivity apps will help in making your business process smoother regardless of business type or size. 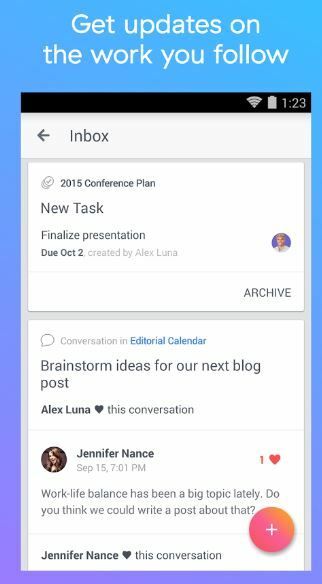 Drag transforms your Gmail into organized Task Lists. 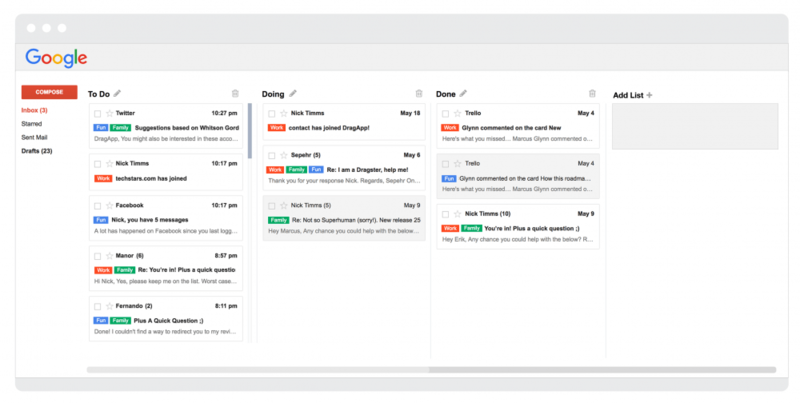 It’s a free Chrome extension that turns your inbox into a manageable workspace (just like Trello, but for Gmail). Marvel is a creative platform that has the power to bring your ideas to life! Marvel allows you to create interactive app prototypes and it’s free with no coding skills required. You can sketch an app demo within minutes which can easily be incorporated into Marvel through taking pictures and linking them together to form a realistic prototype. This app is perfect for you to quickly prototype your ideas and share them with others. 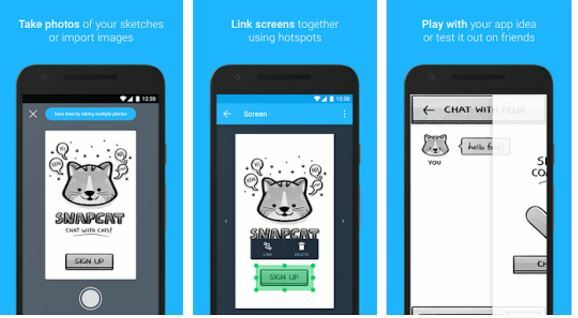 Draw your app screens on paper, whiteboards then take photos of each screen using the app. Once you’re done, you can link each screen together using touch areas to form your app demo. Prototypes can be shared using Email, SMS or Twitter. Top Features: Easy sharing and linking. Asana is the easiest way for teams to track their work. From tasks and projects to conversations and notifications, Asana enables teams to move work from start to finish. You can create tasks, to-dos, reminders, and requests from anywhere in the app (or from your home screen, with the widget). Once the project is created you can add due dates, assignees, followers, details, and files to your tasks. Individuals and small teams of up to 15 people can use Asana for free with certain limitations. With attractive design, fluid interactive elements, and generous team member allotment Asana is one of the most powerful productivity apps in the market right now. Top Features: Track your work on Android, even when you’re offline. 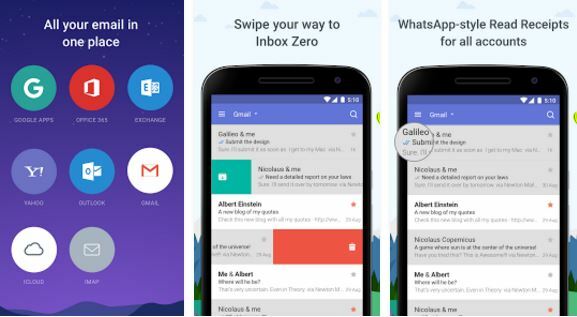 Newton is a powerful email aggregator with a great degree of customization and features that make it easy to use. 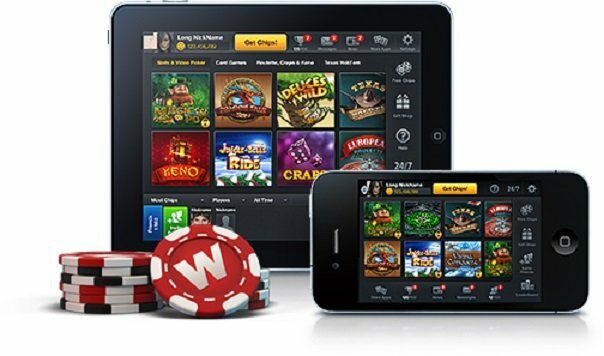 It is also completely integrated with many other third-party apps and even syncs across all your platforms, whether desktop or mobile. This ease of use and its intuitive interface make Newton a solid email aggregator. It provides instant push notifications for all types of email – Gmail, Hotmail/Outlook, Exchange, Yahoo Mail, iCloud, Google Apps, Office 365 and any IMAP account. It also allows you to remote wipe your data in case you lose your device. It integrates your email workflows with major productivity software like Todoist, Evernote, Trello, Zendesk, and others. Top Features: Undo Send, Supports all versions of Exchange – ActiveSync (EAS), EWS & IMAP. 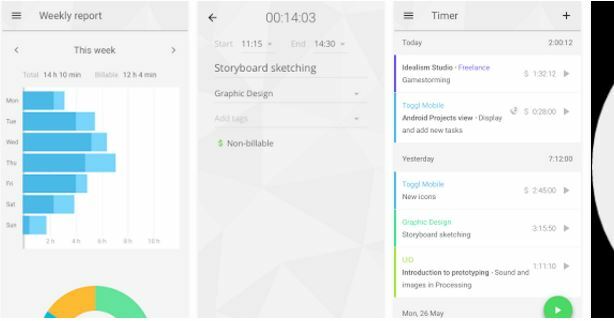 Do is a task management application that enables users to easily plan and see their daily to-do list at a glance. 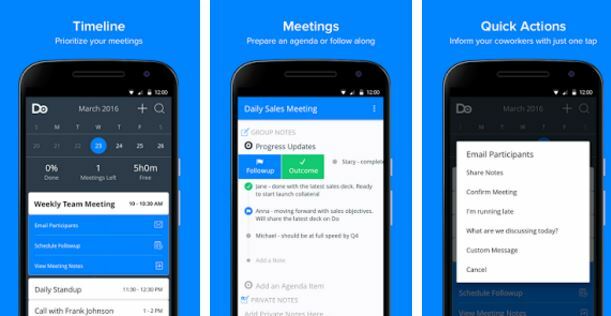 On the app, you can prepare for upcoming meetings by setting agendas, sharing it with colleagues, and attaching files. You can also assign tasks to members through the app thus increasing transparency and accountability within the team. Top Features: Write or dictate meeting notes, Send and receive automatic meeting summaries via email. 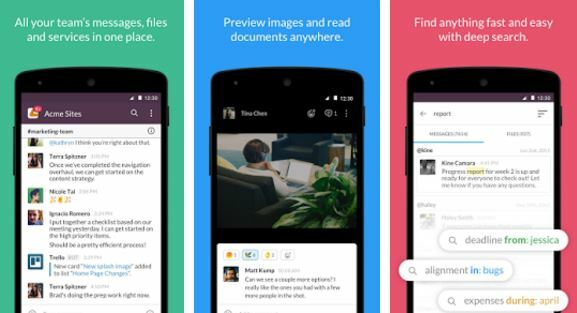 Slack is an app for increasing the team productivity and team communication. It is an office productivity tool that collaborates everything at one place so you can get more work done, whether you belong to a large enterprise or a small business. It is a best to do list app that Checks off your to-do list and move your projects forward by bringing the right people, conversations, tools, and information you need together. Slack is available on any device, so you can find and access your team and your work, whether you’re at your desk or on the go. The streak is a great CRM tool that integrates with Gmail or Google Apps. It allows you to keep track of where you are in your business relationship. You can view all emails associated with each client directly within Streak, and a newsfeed can keep everyone on your team updated on the status of everything in the app. Streak can be used for CRM, sales, email support, hiring, product management, fundraising, event planning, and more. Top Features: Based in the Cloud, Replace multiple external systems with Streak. Great list, thanks for the review. A good app should, indeed, have the basics to be productive, whether that’s the flexibility of calendar or the ability of collaboration. 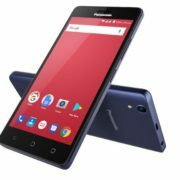 For me, one the most important features is the possibility to work on the cloud, form a computer to a smartphone, it’s important to be able to sync my tasks anytime, anywhere. Our team at Zenkit created a free online app with a lot of those features. 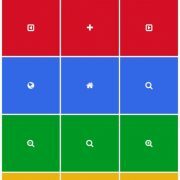 We also wrote an article on productivity app and we would love your feedbacks. Nice list, thanks. In my opinion, a good productivity app should be easy to use for everyone in the team, efficient and multifunctional. 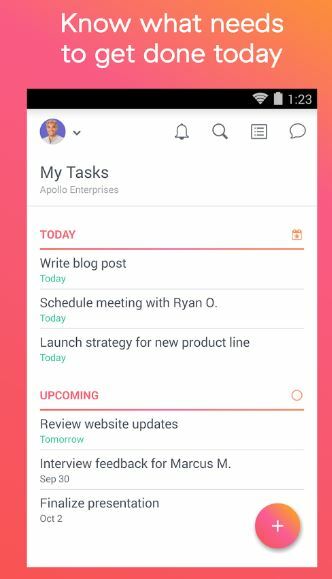 The app that I could definitely recommend because my team loves it is Kanban Tool ( https://kanbantool.com/ ). We’re a small company so I know it works well for companies like us, but I’m sure bigger firms will benefit from implementing the software as well.